Tankless water heaters for the home are becoming very popular — especially when you think about the fact that heating water accounts for 25% of the energy used your home. It only makes sense to heat water more efficiently, if you can. Unlike a conventional water heater that is constantly “on” in order to have hot water available when you need it, a tankless water heater is different in that it turns “on” only when it’s needed and heats your water on demand. Tankless water heaters cost 3 times more than conventional hot water heaters to buy and install, so you’re probably wondering if they are really worth it or not. Never runs out of hot water. Heats water directly without having to have a storage tank. Doesn’t have the heat loss that a conventional water heater has. Can provide between 2 to 5 gallons of hot water per minute. Less risk of water damage. A gas-fired one delivers higher flow rates than an electric one, but both can save you money in the long run. Longer life expectancy than traditional hot water tanks (20 years vs 12 years). More advantages of tankless water heaters are explained in this video. A common complaint of tankless water heaters is inconsistent water temperature. Depending on the type and size that you buy, as well as the number of rooms and appliances you aim to heat water for, your results could be less than desired. For example, you typically cannot run 2 appliances at the same time without having your tankless water heater hit its limit. For example, if you take a hot shower and run your dishwasher at the same time, your hot water limits will be compromised. One way to get around this is to buy a tankless water heater that is designed for the entire house. Or you can buy more than one tankless water heater. You could even buy a separate tankless water heater just for your dishwasher, if you wanted to. Another downside is the cost. Because tankless water heaters cost much more than traditional hot water heaters, it can take up to 22 years to break even — which is longer than the 20-year lifespan of many models. Finally, the cost of replacing your hot water tank with a tankless water heater can be expensive. For example, whole-house tankless water heaters cost between $800 and $1,150 (versus between $300 and $480 for traditional hot water tanks). 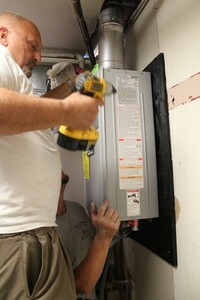 Tankless models also need electrical outlets, upgraded gas pipes, and a new ventilation system. As a result, the installation cost for a tankless water heater is around $1,200, compared to approximately $300 for a hot water tank. Here’s some interesting feedback from homeowners and plumbers regarding tankless water heaters. As with conventional hot water heaters, tankless water heaters do require some maintenance — such as flushing mineral deposits from the unit once a year or so. Choose your tankless water heater based on the amount of hot water you need at your home’s peak demand. In other words, what’s the most hot water you need at any given time? If everybody wants a shower in the morning and you know you use X number of gallons of hot water at that time, then purchase a tankless water heater that can provide that much hot water at any given time. Consider the number of appliances you have that use hot water, and factor that in. When deciding between gas vs electric, it’s worth noting that gas tankless water heaters give you a bit more hot water than electric tankless water heaters do. A tankless water heater can decrease your energy bill, which is good for the environment as well as your pocketbook, but the true cost savings over time might be negligible — depending on the type and size unit you buy. Only you can make the decision about whether the extra cost to buy and install a tankless water heater is worth the savings in the long run.